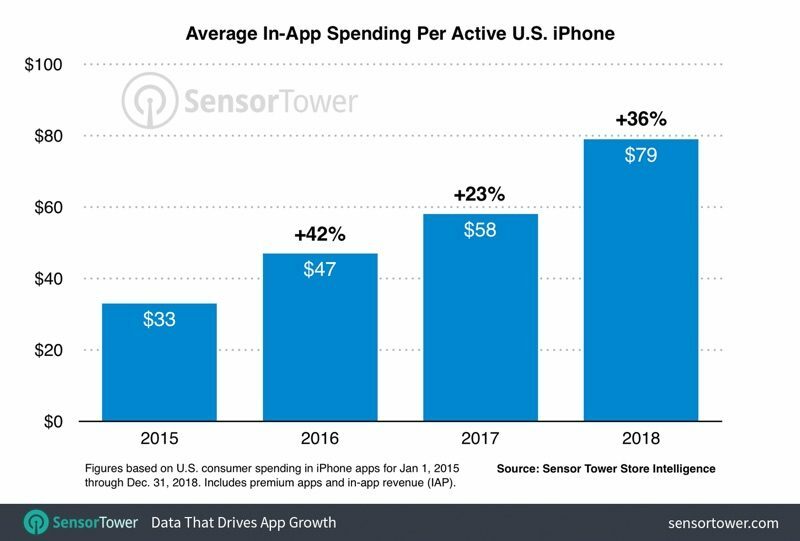 iPhone users in the United States spent an average of $ 79 on games and apps in the App Store in 2018. This emerges from a forthcoming Sensor Tower report released today by TechCrunch . At $ 79, revenue per US iPhone rose 36 percent year-on-year, compared to an average of $ 58 per iPhone in 2017. iPhone users spent about $ 21 more on In-App in 2018 Purchases and paid downloads. Much of the growth in spending came from mobile gaming. 56 percent of the total US $ 79 accounted for App Store games. The expenses also increased in other categories such as entertainment, music, social networking and health and fitness. Sensor Tower believes that subscription apps help increase spending in many of these categories. Apple's App Store is an important revenue driver for Apple in its service category, with app purchases constantly setting new sales records. The App Store hit a new record for one-day sales on New Year's Day. For example, customers spent a whopping $ 322 million. During the holiday season, including Christmas and New Year, the App Store achieved more than $ 1.22 billion.